Item has been discontinued. We apologize for the inconvenience. Headrail: Extruded PVC 1.135 width x .935 height x .070 thick for widths up to 68". At 69" and wider the headrail measures 1.5" widht x 1.5" height x .070 thick. Bottomrail: Extruded hollow PVC 1.035" width x .450" height x .055" thick. Wand: Extruded PVC Hex shape- .315" across flats. Color coordinated. 31 in. L Slat: Extruded PVC .0197" thich x .970" width with crown of .160". 75% opacity. Flammability testing passed NFPA 701 small scale test. Tape Roller Support: Injections molded plastic with metal roller minimising cord fray. Tape Roller: Injection molded plastic with ladder locking legs. Tilt Rod: Plated steel- "D"shape .150" x .125" Cordlock: Injection molded plastic. Smooth brass fixed roller. Knurled floating brass roller. Bottomrail Endcaps: Injection molded plastic. Bottomrail Anchors: Injection molded plastic face .5" diameter- stem .375" diameter. Slat Clip: Painted Aluminum. Cord: Woven Polyester .070" diamter. Ladder: Woven polyester .840" spacing x 1" width. Center Support: Plated steel .040" thick. Hold Down Brackets: Injection molded plastic. Tassel: Injection molded plastic - bell shaped. Mounting Bracket: Color coordinated injection molded plastic. Suitable for inside or outside mount. Slide On Curtain Bracket Now hang curtains fast on your mini blinds. Our brackets save time and protects your walls! Use these brackets to hang curtains fast and without nailing. 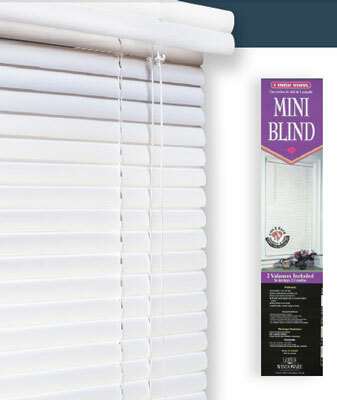 Fits 1" Vinyl Mini Blinds With Front Caps - Can hold up to 10lbs - Available in Alabaster Only - Free Shipping - Click bracket picture for more details.